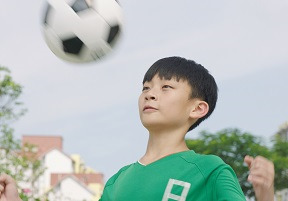 As we become more aware of the long-term effects on cognitive function from concussions that occur on the sports field, a new study published online this week in Frontiers in Neurology, reports that a common soccer move can cause more damage than we thought. Researchers at Albert Einstein College of Medicine found the efforts to reduce long-term brain injuries may too focused on accidental head collisions and not on soccer heading, a common soccer play where players hit the ball with their head. “Unintentional head impacts are generally considered the most common cause of diagnosed concussions in soccer, so it's understandable that current prevention efforts aim at minimizing those collisions," said study leader, Michael Lipton, M.D., Ph.D., F.A.C.R., professor of radiology and of psychiatry and behavioral sciences at Einstein and medical director of MRI Services at Montefiore. "But intentional head impacts -- that is, soccer ball heading -- are not benign. We showed in a previous study that frequent heading is an underappreciated cause of concussion symptoms. And now we've found that heading appears to alter cognitive function as well, at least temporarily." In a study of about three hundred amateur soccer players in New York City, ages 18 to 55, researchers found that “players who reported the most headings had the poorest performance on psychomotor speed and attention tasks, which are areas of functioning known to be affected by brain injury.” While of “borderline significance,” these players demonstrated “poorer performance on the working memory task.” The concern is that while we tend to focus on the effects of accidental head impacts, these did not show a relation to “any aspect of cognitive performance.” It’s the everyday ball heading that is more of a concern. Cautioning your soccer star nieces and nephews - and their parents - to keep their soccer heading to a minimum will likely reduce possible brain injury. As Dr. Lipton advises, soccer heading in in the player's control and so its consequences can be prevented.